Your unimog climbs the steep trail through the Tongass rainforest outside of Ketchikan — up muddy trails that you doubt even a Jeep could handle. Six of you heading to the top of the zipline course that runs through the treetops. At the top, you suit up in harnesses, helmets, gloves. Get the safety talk. You see the first couple of wooden platforms that hug the tree trunks 130 feet in the air — like children’s tree houses. Nervousness sets in for some in the group — fear for others. But there are no takers. Clip, clip, clip and you are committed. The first step is the hardest. Your mind knows that you’re safely tethered to the ropes. But your eyes trick you. You’re stepping off the edge. Your heart races. You sweat. You step off. And then you sail — riding on the cables and a rush of adrenaline. If you let yourself enjoy it, it’s the best feeling in the world. So many parts of the experience contribute to the rush. 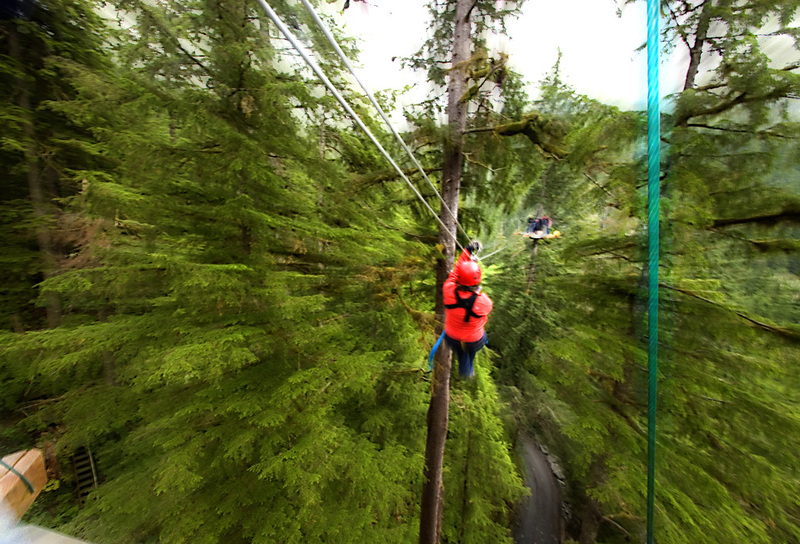 The zipline course includes eight runs. You zip through the treetops from platform to platform — small wooden platforms that bring the group very close together. Platforms that have no safety rails on the edge. Forget personal space. Your instincts tell you to stick close to the tree trunk — even though you’re so clipped in to the cables there’s no way you could fall off. Did you know that healthy trees sway when the wind blows? That’s how they don’t snap in the breeze. But that doesn’t provide much comfort 130 feet up the tree — because a swaying tree means the whole platform is swaying. After the first couple of runs, you get the hang of it. And that’s when you look across the valley at the long run — a 750-foot stretch. The rope disappears into the branches. You can’t even see the platform on the other side. You step off in blind faith. The adrenaline keeps pumping. You pull your legs in close to your chest on the long stretch to make sure you make it to the end. Speeding across at up to 40 miles per hour. You’re pretty sure you’re grinning the whole way across. From the perches, you stop to enjoy the view. You might see bald eagles watching over the valley, salmon jumping in the stream below, and you might get lucky enough to spot a bear welcoming the jumping salmon with open jaws. And then you encounter the suspension bridges — rope bridges designed to reposition the group in the forest. They shake and bounce as the group tromps across and are more worrisome than the zipline. Zipping toward the last platform now. The letdown of ending seems to overshadow the adrenaline rush. You don’t want to stop. You’ve got the hang of this now. You’re addicted to the adrenaline and you want more. On the last platform, your guide starts the wrap-up speech. You look around at what you’ve accomplished. Good stuff. And then you realize… there are no steps to get off the last platform — which is 55 feet high. One of the guides mentions that the only way down is to jump off. Literally. Clip, clip, clip and he steps over the edge and sails to the ground below. Your heart races. You sweat. A new rush of adrenaline.